Choosing a baby shower theme for a boy will be a breeze with these ideas. 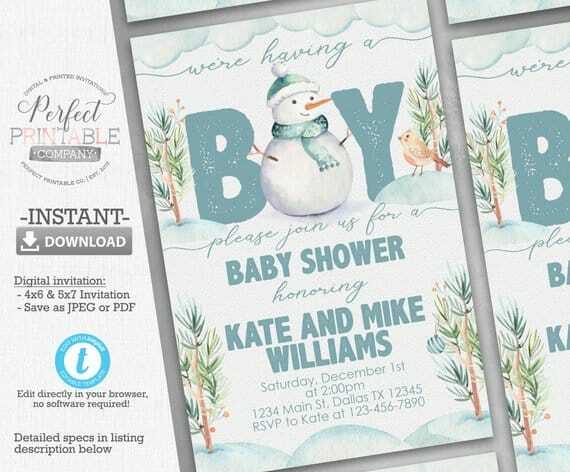 Whether you are looking for a unique, modern, or traditional boy baby shower theme you’ll find here something the mom-to-be will love. 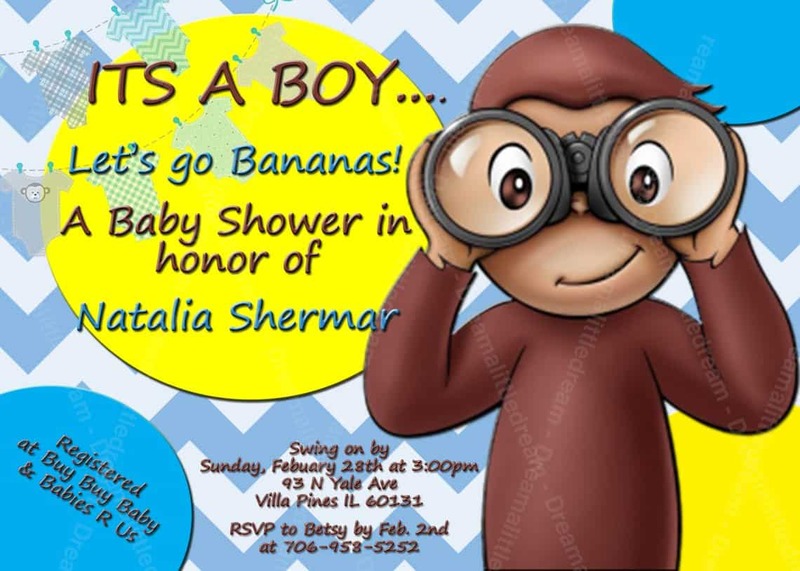 A fun collection of baby shower invitation, decoration, food, and game ideas awaits you! The links in this post contain affiliate links and I may receive a small commission if you make a purchase after clicking on my link. Unique baby shower themes for boys are awesome but the themes that have been around for some time are just as special and amazing. As long as the theme is something the mom-to-be loves you are good to go. You can always host the baby shower with a little twist: combine themes, pick unexpected colors or a little different focus. Let’s use safari theme as an example. Instead of filling the baby shower venue with baby safari animals you could decorate with safari vehicles and safari gear such as safari hats, binoculars, maps, and guidebooks. Use ideas from safari countries (Kenya, Botswana, Tanzania…) when choosing centerpieces and backdrops. It would be a fun unique baby shower theme. More safari theme ideas with safari animals later in this article. Have fun going through this list of themes! Many of the baby shower theme ideas presented here are also great for a gender neutral baby shower. Once you have your theme chosen you might also want to check out these cheap baby shower ideas. 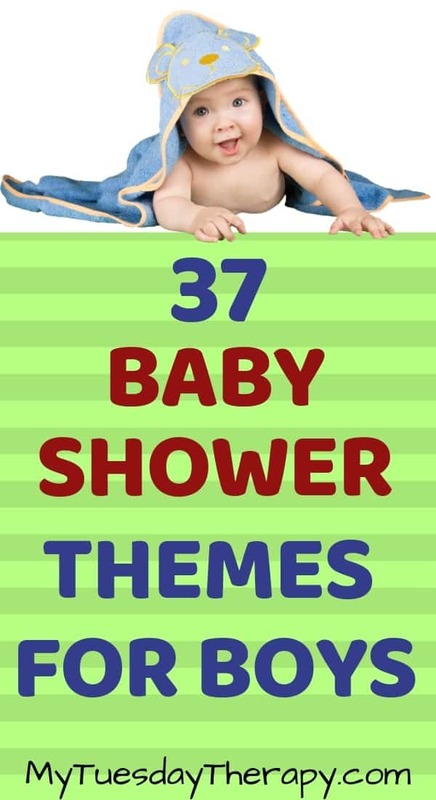 This is more than a list of baby shower themes. You’ll find here cool ideas for each theme to help you to get started on the beautiful task of hosting a baby shower. Sometimes a theme might sound like a “blah” but then you see all the fun things you can do with it and it goes from blah to WOW! I’ve got several cool diaper cake ideas too that can aid in finding the perfect baby shower theme. Life’s better at the beach! Bring the refreshing beach to the baby shower with blue, white, and sandy colored decorations. 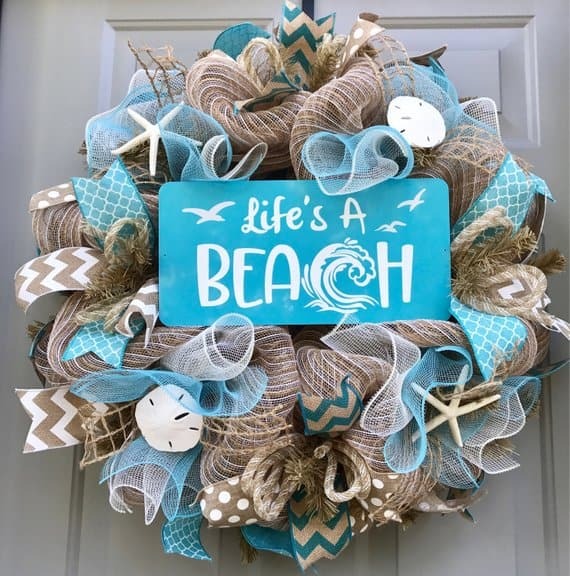 Get the rustic Life’s A Beach Burlap Wreath from Beautiful Mesh to set the mood and to give you inspiration for other decorations. These lovely neutral colors provide a place for the expectant mom to relax and be showered with love. 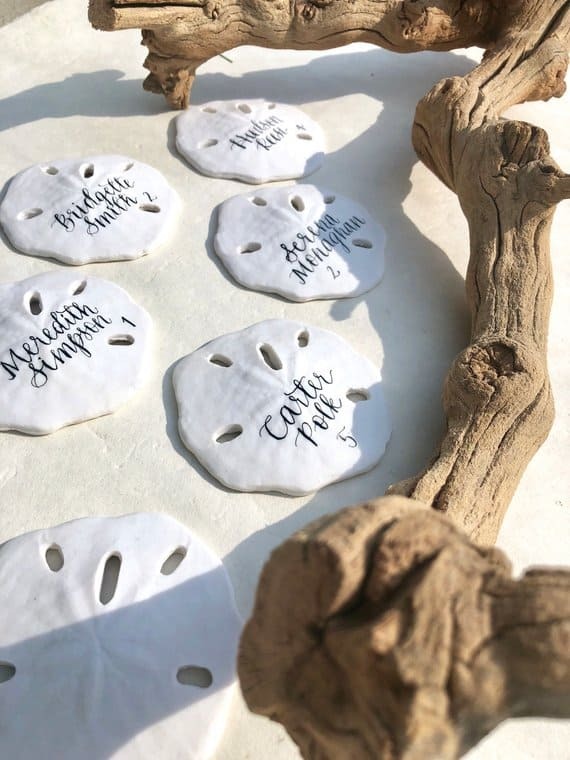 The guests will be delighted to find their name written on the cute sand dollars used as place cards. A beautiful handmade item from Upside Designs Shop. Sand dollars (buy in bulk) make cute favor tags too for a beach theme baby shower. The gift or dessert table will look lovely with this classic striped cotton towel draped over it as a tablecloth. The cute tassels in the ends add a nice touch. 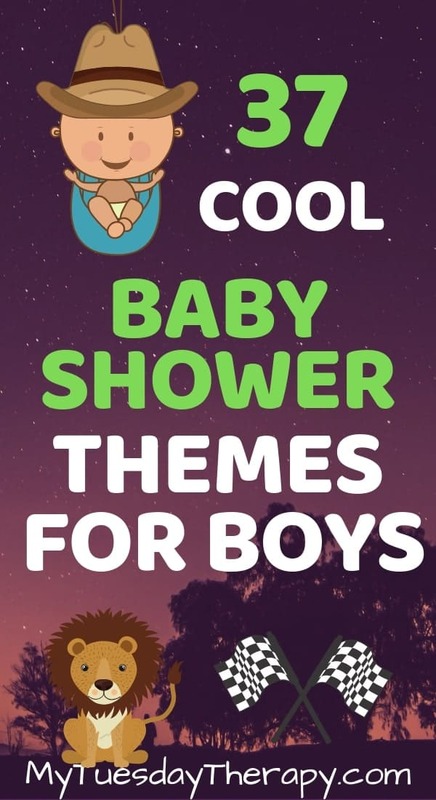 Other things to go with the theme include starfish, seashells, beach balls, shovels, sunglasses… With right colors you can make this boy baby shower theme to fit the taste of any mom-to-be. Make “crab-wiches” (croissants with googly eyes), serve seaweed (spinach) dip, saltwater taffy, fruit slice or boiled egg-half sailboats, oyster pearl cookies which are simply Nilla Wafers filled with blue frosting and a white Sixlet as a pearl. Decorate onesies or bibs with lovely beach theme iron on appliques, write messages on beach ball, put together a beach bag for the mom, play a round of starfish shaped bean bag toss or play a couple of the many printable games in beach theme. Sand Dollar Place Cards: Upside Designs Shop or Make your own with sand dollars. 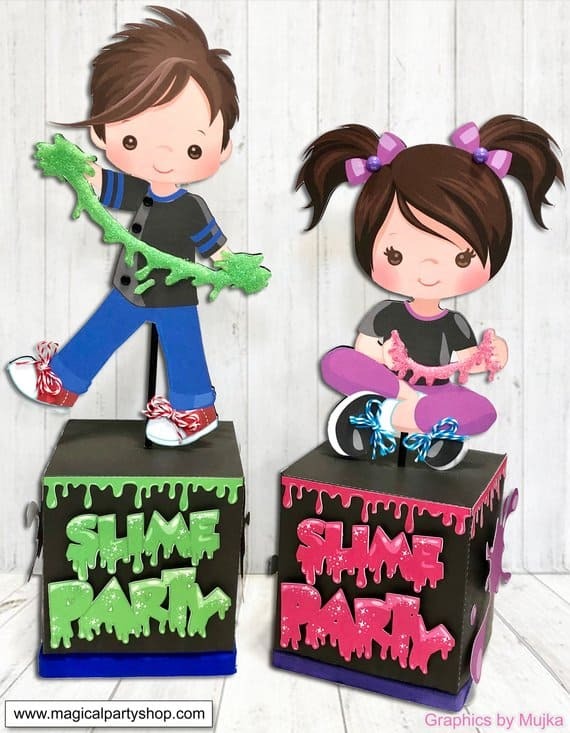 If you spend time on Pinterest you have probably seen all the slime recipes floating around. Kids LOVE that stuff. 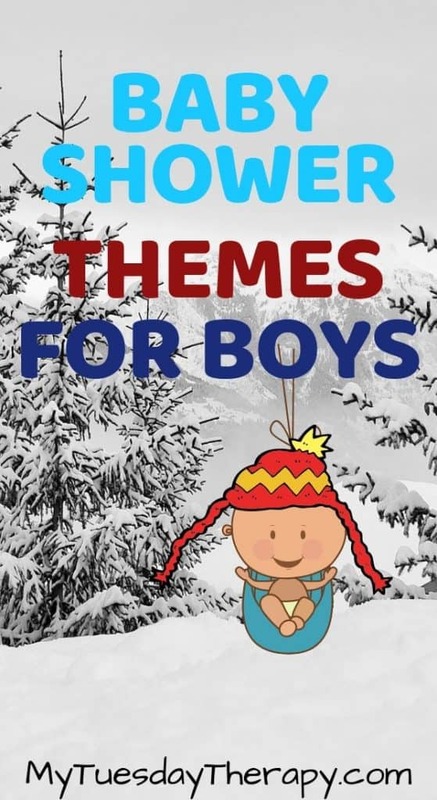 This certainly would be a unique boy baby shower theme. And even if your whole theme is not about slime this could be an idea to include in a “what are little boys made of” baby shower. This party will make you smile! Slime Party Centerpiece: Magical Party Place. I saw a fun sign at a pirate theme baby shower: Not All Treasure Is Silver or Gold. And that is so true. A baby is a treasure and this party is here to celebrate that. Cover the tables with white and red striped table cloths. Red and white jumbo gift wrap makes a great runner for the table. Place bowls filled with gold wrapped candy on the tables for sweet baby shower decor. Set out little treasure chests filled with toy or chocolate coins or other treasures. And add a message bottle on each table for the guests to leave encouraging notes for the mom-to-be. Your guests will enjoy these delicious pirate cakepops. Grapes or whoppers can be delicious cannon balls. And chocolate dipped pretzels make great “peg legs”. Serve also fish ‘n ships. As a fun pirate baby shower activity decorate treasure chest or pirate baby cookies. Welcome aboard on a great adventure. We all hope that the days with the newborn baby will be smooth sailing. 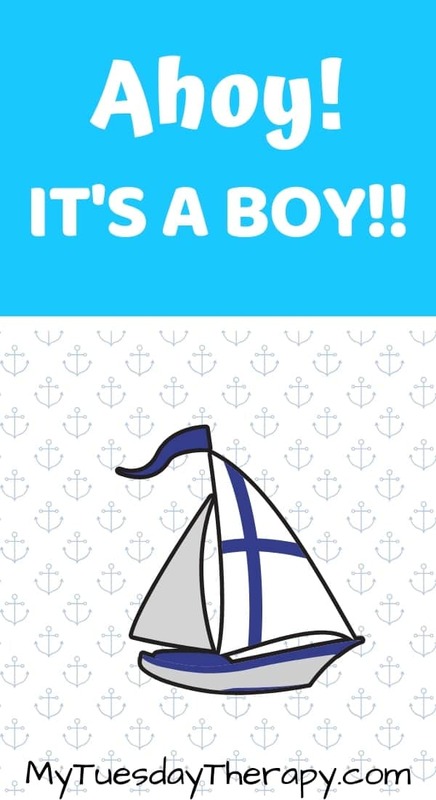 Nautical baby shower theme is cute and classy. Many wonderful things to use as baby shower decoration from anchors to brass bells to telescopes. Hang a Ahoy It’s A Boy banner above the gift table. Add a life buoy and and anchor complete the look. Steer the baby shower ship to an adventure with a wooden ship wheel. The wheel, anchors and buoy will make also great nautical nursery decorations. Swedish fish, gummy sharks, gold fish, veggie boats, blue jello… Decorate a cake with anchors, ship wheels or Ahoy it’s a Boy cake topper. Make anchor and ship wheel wreaths. Mia Precious Memories has cute unfinished ship wheels in various sizes ready to be decorated. The guests could decorate one for the nursery or to be taken home. Wood Ship Wheels: 4 to 10 inches or 12 to 16 inches. Anchors: 4 to 10 inches or 12 to 16 inches. Play guess how many goldfish in a jar, play price is right, who knows mommy best and other baby shower games in nautical theme from Shop Hadley Designs. Check out also Cheap Baby Shower Ideas on How To Host a Baby Shower On a Budget. Babies get hungry so did the caterpillar. This classic picture book gives you cute ideas for a colorful fun-filled baby shower. Adorn your cake or cupcakes with darling Very Hungry Caterpillar Cake Decorations from Holly Cupcake. Wall Art from Amazon to be displayed at the baby shower. There are many cute Winnie The Pooh quotes such as As Soon As I Saw You, I Knew An Adventure Was Going To Happen to display at the baby shower. Give the guests a practical but cute favor. These honey jars don’t have labels so they are easy to personalize. Winnie The Pooh offers plenty of lovable ideas for hosting an amazing baby shower for a boy from cute Hunny favors to fun games. A fun theme for a boy! 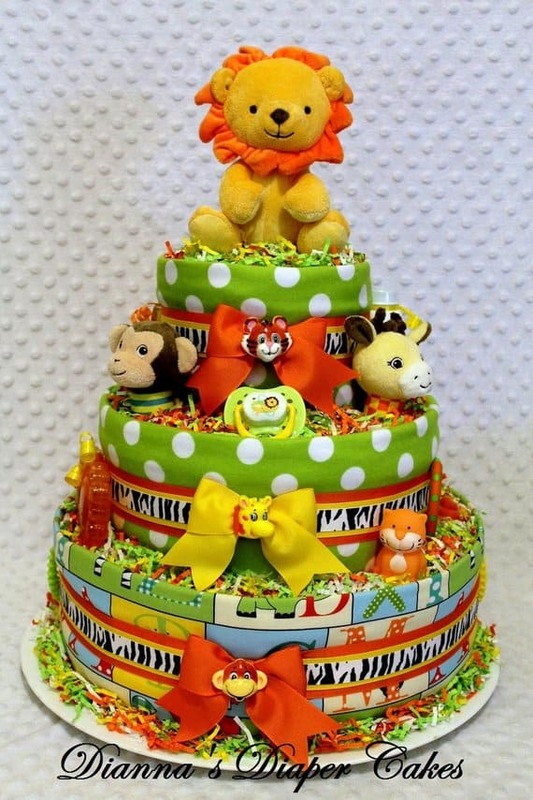 Zoo or Safari Diaper Cake from Dianna’s Diaper Cakes gives you a fantastic color scheme for the baby shower. Imagine all the cute things you can do with this theme from zebra cake to polka dot napkins. Place a few green plants in the party area, around the dessert and gift tables. Hang green garlands from wall to wall to give the place a jungle look. You’ll love this burlap garland with leaves! Serve simple jungle themed food such as juicy fruit: mangoes, bananas, papayas. Make coconut chocolate truffles, cupcakes with monkey toppers or a cake decorated with fruit slice candy. Serve mud cake or dirt pudding with gummy worms. Delicious lemonade or smoothies are perfect beverages for this jungle theme baby shower. Your guest will have a great time matching baby animals (e.g. cub) to the animal name (e.g. tiger). Or playing children’s book emoji game. In this game you try to figure out the book title based on emojis. This printable is safari themed so it works perfectly! Beautiful colors for a lovely baby shower! 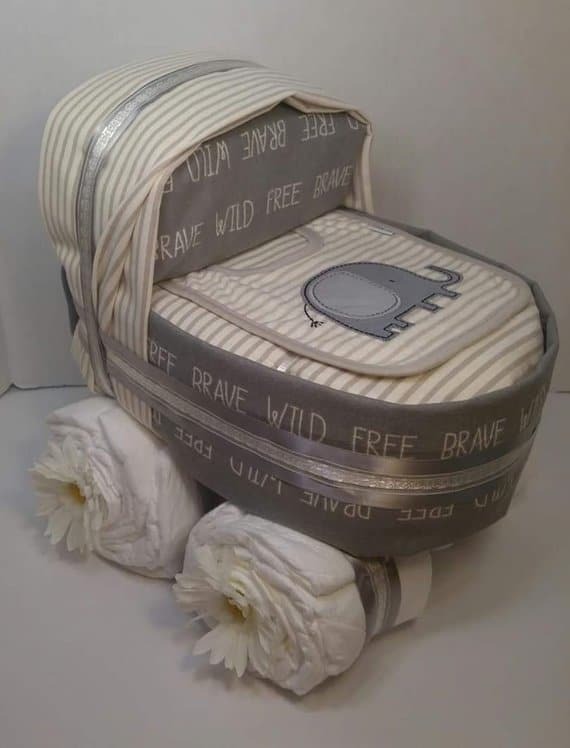 This Elephant Diaper Stroller from Snuggle Up Diaper Cakes is gorgeous. Brave, wild and free! Gray, blue, and white lanterns go well with this baby shower theme. The soft colors of the lanterns will create a beautiful atmosphere. Peanuts, peanut butter sandwich cookies dipped in blue icing, elephant shaped cookies all go well with this theme. Blue jello with cool whip and an elephant cake topper is a cute treat too. Baby shower activities could include things like “how many peanuts in a jar?”. The mom will love to receive these beautiful elephant onesies decorated by the friends and family. 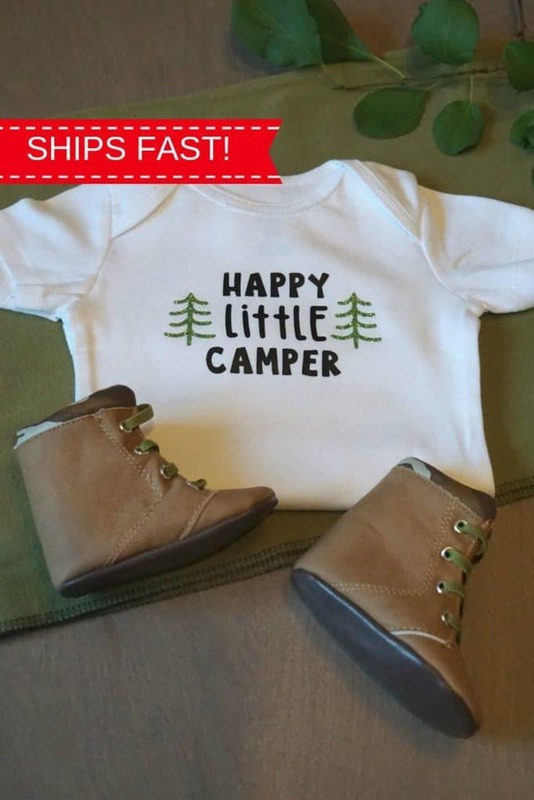 This set has onesies in various sizes all the way to 24 months and it comes with adorable iron on graphics. and host the cutest baby shower ever! According to Urban Dictionary vintage is something that is too old to be modern but not old enough to be antique. Search the attics, thrift shops etc. for Golden Books, wind-up toys such as this awesome retro Ferris Wheel, metal trucks and planes, wooden toys, cabbage patch kids, weebles and use them as decorations and inspiration for cup cake toppers. Make petit fours and decorate them to look like abc blocks. Maybe spell out baby shower or the baby’s name with them. Use Radio Flyer wagon to serve cupcakes or other snacks. 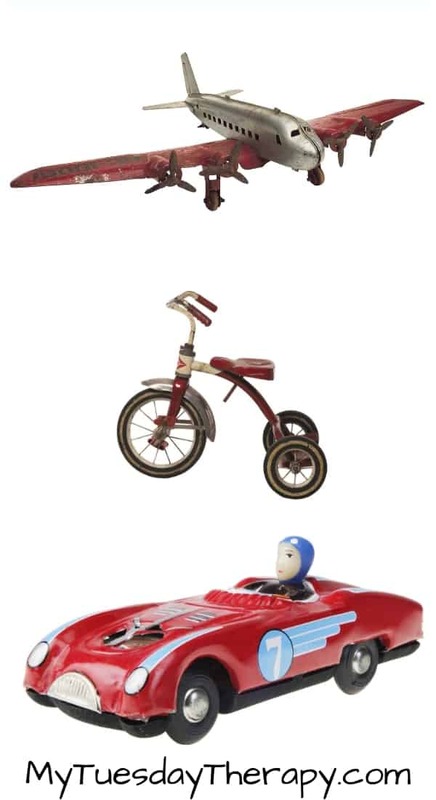 Get wind up toys and have a race with them. That will surely bring lots of laughter to this playful nostalgic baby shower. Paint vintage airplane mobile to be used as a decoration in nursery. If you are interested in vintage themes you might want to check out this Vintage Travel Theme Baby Shower. One thing I love about kids is their curiosity. George, the little monkey, was curious too. The adventures of George might have been some of the stories that delighted the mom-to-be too when she was a little girl. Bananas in every form: banana bread, banana pudding, banana parfait, banana split, banana cream pie, banana muffins, frozen banana treats, banana pancakes, banana shaped candy… you get the picture. Go bananas! Since Curious George liked balloons, kites, bikes, and art use those themes to inspire you to create the most delicious and amusing treats. Make kite shaped cookies, balloon or pinwheel cupcake toppers, and paint brush pretzel sticks. Buy the cutest Curious George themed cookies from Little Prince Cookies. You’ll love the way they look. Adorable!! Tie a chocolate bar or wrapped cookie to an inflated balloon and place on the dessert table or use as a place card and a party favor. Ask the guests to write a note for the baby in a Curious George book. This collection has seven books. You could put one at each table or make a book signing station. Play pin the banana to George. Or two or three of the many monkey baby shower games. Host an action packed baby shower: Captain America! Decorate the party area with red, white and blue. You might already have items at home to go with this theme. Lot of the 4th of July stuff goes with this theme. 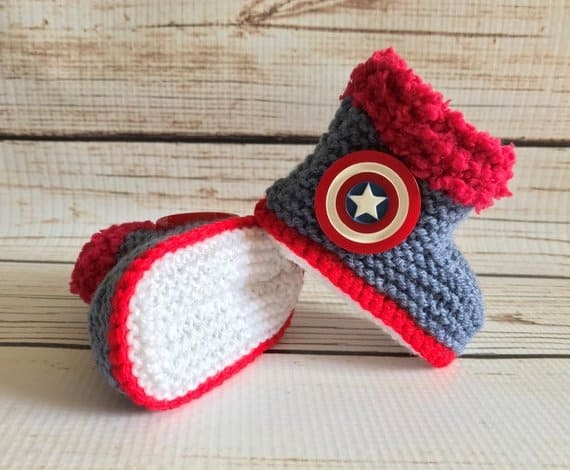 The cute Captain America Baby Booties from Funky Knits UK are a cute centerpiece and also a fun baby gift for a boy. Use this 58×58 shield shaped play mat either as a wall decor or as a table runner for the gift table. The mom to be will happily take the fun play mat home after the shower. Hang up Captain America Onesies for a fun garland or get creative and use them as centerpiece. Strawberries, marshmallows and blueberries arranged on a round plate to form Captain America’s shield. Have a great time playing pin the star to the shield. Toss star shaped bean bags onto a shield shaped target. Don’t want to limit yourself to one superhero? You could also do a general superhero theme. Let the Wild Rumpus Start!! Boys are full of energy and love to explore. These “Where The Wild Things Are” Blocks from Poplar Street Cottage will look amazing as a centerpiece. Another fun decoration idea is a tree stump planter. Fill it with flowers, baby items etc. Turn any cake into a theme fitting cake by placing this awesome fondant crown cake topper on it (Fancy Sugaron Top). Serve fruit in creative ways: serve them in waffle cones, skewers, brown tree stump bowls etc. 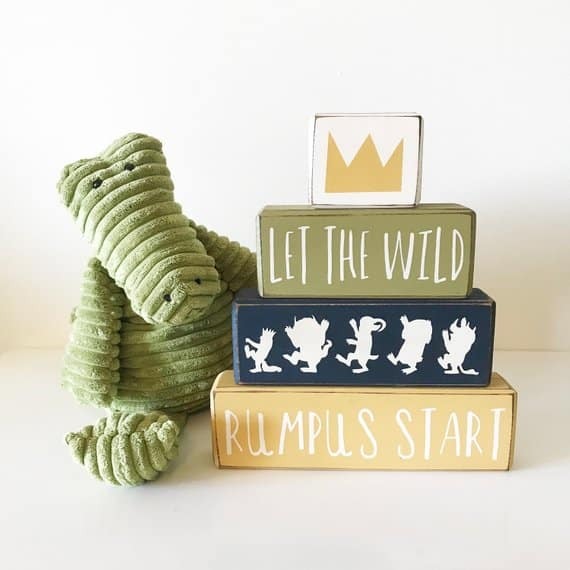 You’ll love this Where The Wild Things Are baby shower kit from Helia Design Co (printable). In addition to incredible games it also includes signs to make your shower awesomely entertaining! 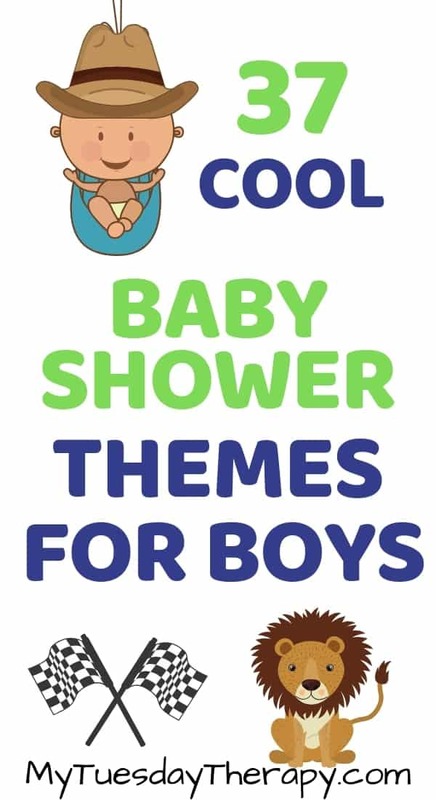 A thrilling boy baby shower theme! Bring the beautiful winter feeling inside with snowflake decorations, snowmen, and snow covered trees. Decorate the tables with pine cones and evergreen branches. Add baby’s-breath flowers in a mason jar along with evergreen. Though everything in the image is pink you can get the banner in blue to go with a boy baby shower. Hot chocolate bar will be a hit at this awesome Baby It’s Cold Outside baby shower. Top the cupcakes with cute mitten and snow flake cake toppers. Serve vanilla candy coated pretzels and powdery donuts. Have yarn and knitting needles available for those who know how to knit and let them work on making baby mittens during the shower. Print a fun mitten pattern too. A no sew blanket station will be a hit! The guests can take turns working on a blanket or two. As with any other baby shower there are cute baby shower game printables available. 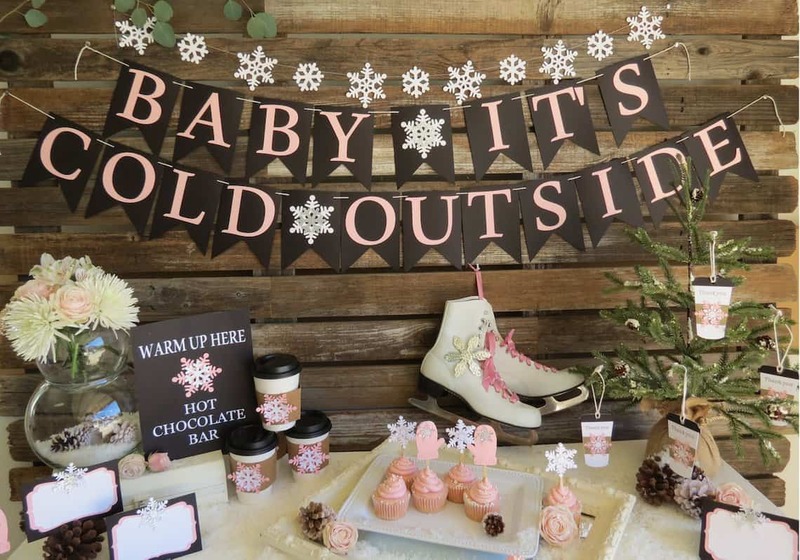 This winter themed game set from Catch Me Studio is perfect for baby its cold outside baby shower theme. Reward the winners with cool baby shower game prizes such as fleece blankets, fuzzy socks, scarfs, or mittens. A mug with hot chocolate mix would make a lovely prize or a favor. Having kids can feel like you are directing a circus. It is fun, it is loud, and there is always some clowning and action going on. Rent a tent or create a circus inside. 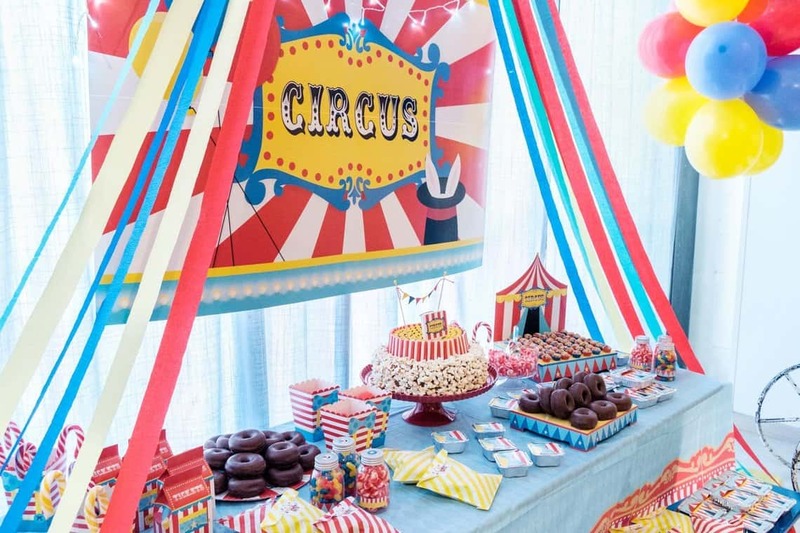 Serves animal crackers, cotton candy, peanuts, pop corn, donuts and big lollipops, and cupcakes decorated with clowns, horses and all the fun things you find at circus. Display the cupcakes in a fun Ferris Wheel cupcake stand. Come One, Come All To the Greatest Baby Shower! A couple of hours fun in the house of mouse. It’s going to be fantastic! 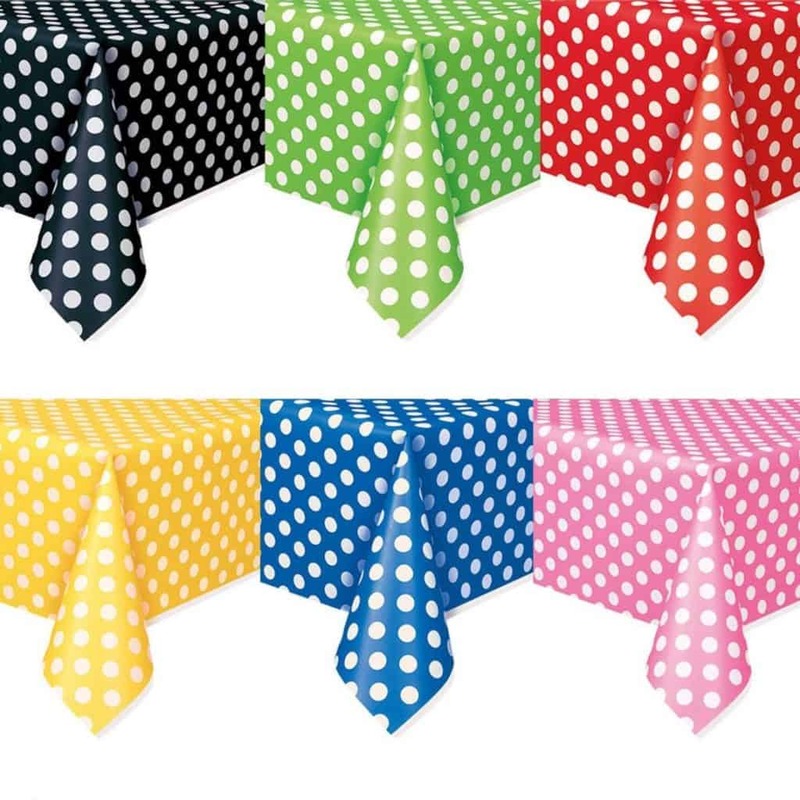 These table covers will look great at your Mickey Mouse baby shower or any other party! Hang one up behind the dessert table as a fun backdrop. Use Mickey Mouse plush toys as centerpieces. Add a baby towel or blanket for Mickey to hold. Hang up lanterns, pom poms and balloons in Mickey Mouse colors: black, red, white, and yellow. Oreos come in handy when making yummy treats for this Mickey Mouse Baby Shower! 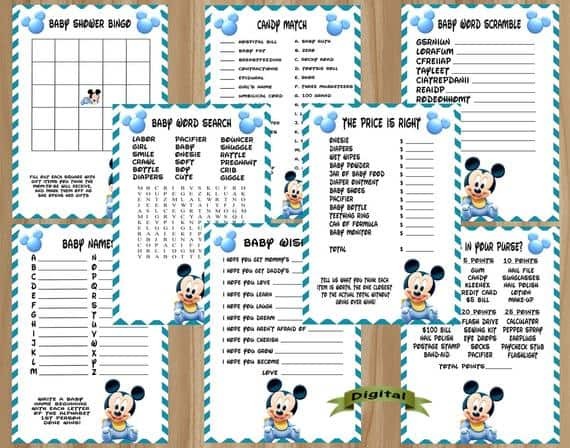 Play the fun Mickey Mouse printable games from Invites On Demand has a fun collection of printable Mickey Mouse games from candy match to what’s in your purse. 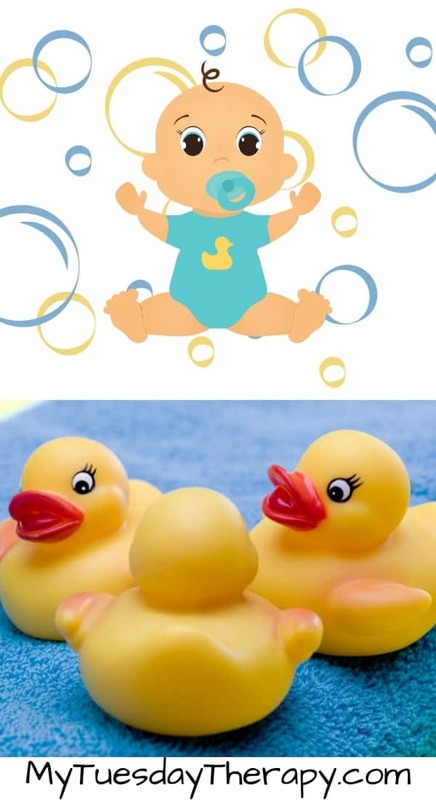 Check out also other Easy Baby Shower Games that will make any baby shower fun! Oink, oink here and oink oink there. Old McDonald had a farm and so can you… at least at this farm baby shower. This party is going to be so cute with all the farm related baby shower decorations. You’ll love this fun printable baby shower game package from Be My Guest Studio. Play games like “Are you my mother?” and “They do what?” A fun game about baby traditions around the world. The illustrations on these printables are cute! If barnyard animals are not what you are looking for, host a rustic farm style baby shower. Rustic country style is now in and for a good reason. It is awesome! These lovely colors go with anything. With burlap, lace, and brown, cream and soft blue colors you can create a memorable baby shower. Who can resist fresh baked cinnamon buns!! Warm, cozy, and delicious are some of the words that come in my mind when I think about this bun in the oven baby shower theme. The guests will love the welcoming, homey atmosphere of this baby shower theme. The cute Bun In The Oven Game is from from Wee Lil Favors. It is easy to come up with decoration ideas for this baby shower. As you know, I’m going to suggest serving cinnamon buns and delicious buns filled with chicken salad, ham and cheese. A hot cup of coffee or tea would also be lovely. I have seen fun versions of this shower as Bun In the Oven, Burgers on the Grill. Perfect theme for co-hosted baby shower. Besides playing the bun in the oven game from Wee Lil Favors, you could bake together. Make cinnamon rolls, buns, cookies or whatever sounds good to you. And if you do the outdoor BBQ, set up lawn games in addition to playing other games. A baby minion is on his way! Minions from Despicable Me is another fun, energetic baby shower theme for boys. Bright blue and yellow are the perfect colors for this baby shower filled with cute minions from cupcake toppers to marshmallow pops. A baby boy baby shower centered around a squeaking awesome rubber ducky theme. This bath time baby shower is so cute. Put rubber ducks in glass bowls filled with water or blue gems and use as centerpieces. Serve blue jello topped with whipped cream and a duck cupcake topper. 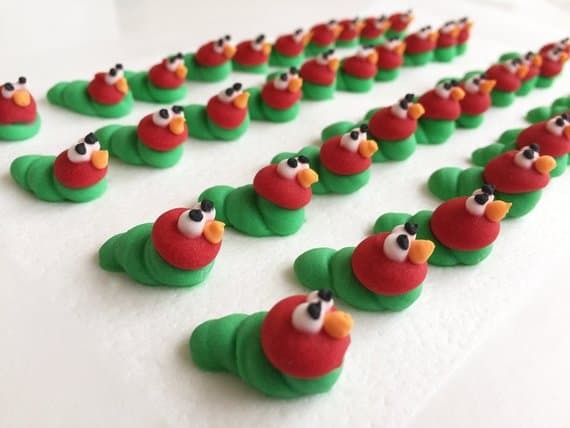 These duck picks from Party Eleganza are adorable and would look fun as cake decorations too. The cake could have blue frosting and whipped cream dollops as bubbles. Prepare bath bombs together. Hide ducks in the party area and whoever finds most is the winner. A magical baby boy theme for a cute tiny muggle. Host the baby shower in the Great Hall or in a common room the mom-to-be belongs to. You’ll find these Harry Potter party decoration ideas for common rooms helpful in creating the right atmosphere. This Harry Potter baby shower bundle from My Porch Prints has printables for invitations, games, signs, cupcake toppers, decorations and more. 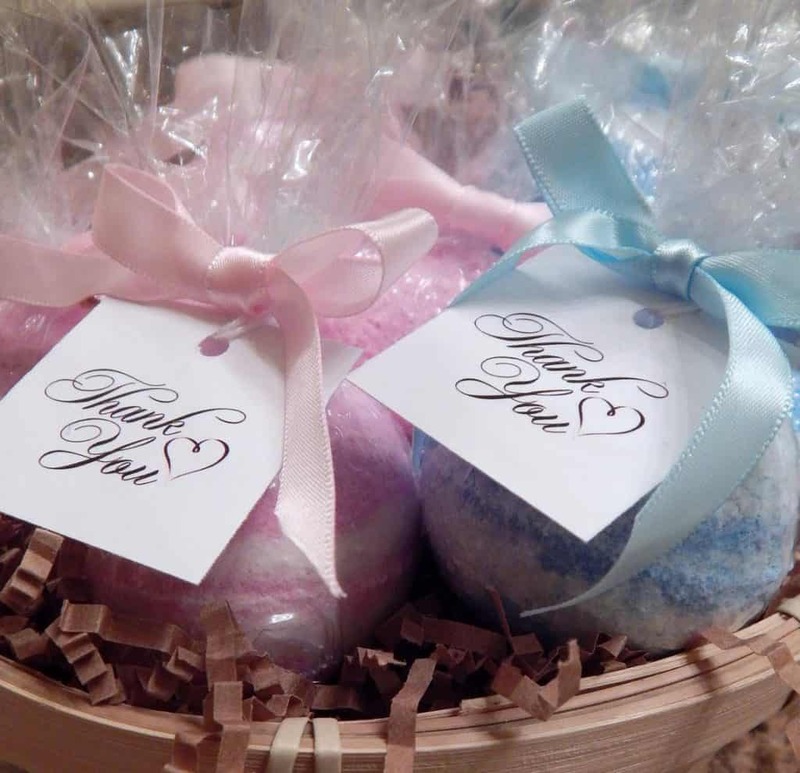 It will help you to host a stunning baby shower for welcoming a new baby muggle or wizard. Serve butterbeer and intriguing Harry Potter party food such as owl cupcakes and chocolate frogs. Play games like find the snitch game. I have wings printables and other fun Harry Potter party printables such as owls for your owlery in the freebies for subscribers. You might also like these Harry Potter activity ideas for your baby shower. Awesome fast-paced baby boy theme that will make your heart race from excitement. You can have a blast with this theme! 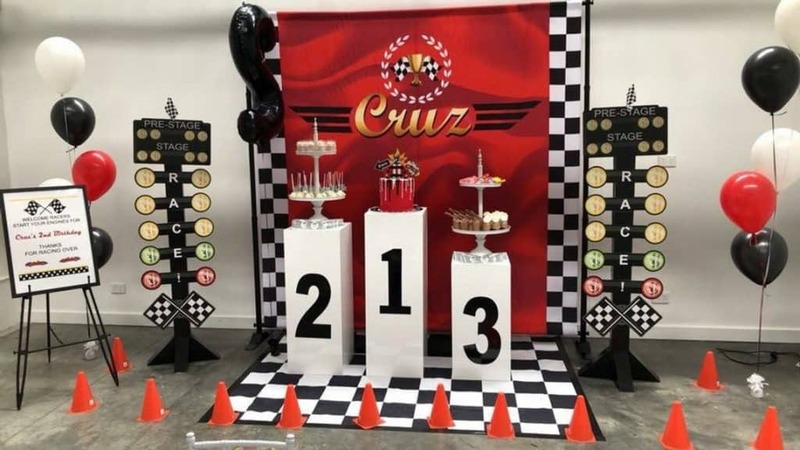 Make the tables look like race tracks, decorate the cupcakes with checkered flags, put race cars all over the place. Many ideas for baby shower decor for boys! Play games like Guess the Baby Food and What’s in Diaper Bag from ABCDE Party. Fill in a jar with licorice wheels and ask the guests to guess how many wheels are in the jar. Celebrate the star of the coming show! The guests will walk the red carpet to the shower and have a picture taken in front of a fabulous backdrop. 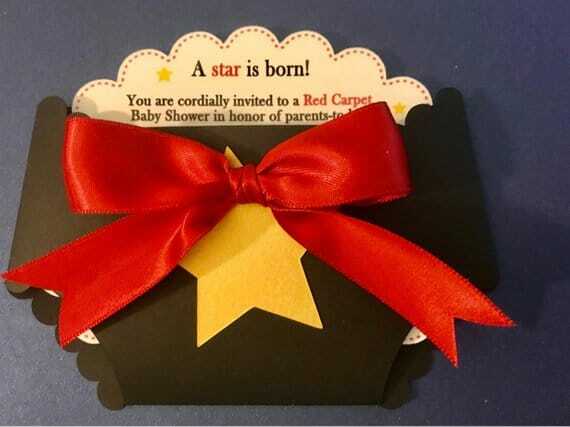 This unique baby shower theme will make everyone feel like a star. Red, black and gold colors create a glamorous atmosphere fit for a Hollywood star. Use movie slates as food labels or to display few fun facts of the mom-to-be. Serve star shaped cookies, spell Hollywood with cake toppers to make any cake ready for Oscars! Prepare a fancy platter of decorated chocolate covered strawberries. Play “Name that movie”. Show a glimpse of a movie or give a few hints. Or match the movie or tv show kid to the mom. Celebrate the new rock star with this fun-filled rockin’ baby shower theme for boys. Decorate venue with guitars, musical symbols and records. Fire trucks and Dalmatians. This party is on fire! I found this cute fire truck decoration idea on Pinterest. This would be an awesome centerpiece for the gift or dessert table. For the other tables you could place fire trucks and dalmatians. Serve a cake shaped like a fire truck or cupcakes with fun edible cupcake toppers. Place Twizzlers in a bucket for fire hoses and serve chocolate donuts as fire truck tires. Firefighter Edible Cupcake Topper: The Sweetest Booth Fire Truck etc. Luminaries: Luminaries by Janet for a baby shower that is not all red and fiery. A super awesome baby shower for a tomboy mom. Truck loads of fun ideas to host this incredibly entertaining baby shower. Fill the trucks with flowers and place on the tables as centerpieces. They would also make fun serving containers for food. Make little signs and hang them from the cranes. Adorn the gift and dessert tables with “caution” tape. Put a Gift Loading Zone sign next to the gift table. Attach a “tools” -label to utensils. Turn traffic cones into centerpieces. Since this is a construction baby shower it would be fun to build something together whether it is a simple craft or building and painting a dresser :). Another boy baby shower theme that has something to do with building stuff. Use lego houses, cars, and people as cute baby shower decor. Make Rice Krispies Treats in various colors to look like lego blocks. 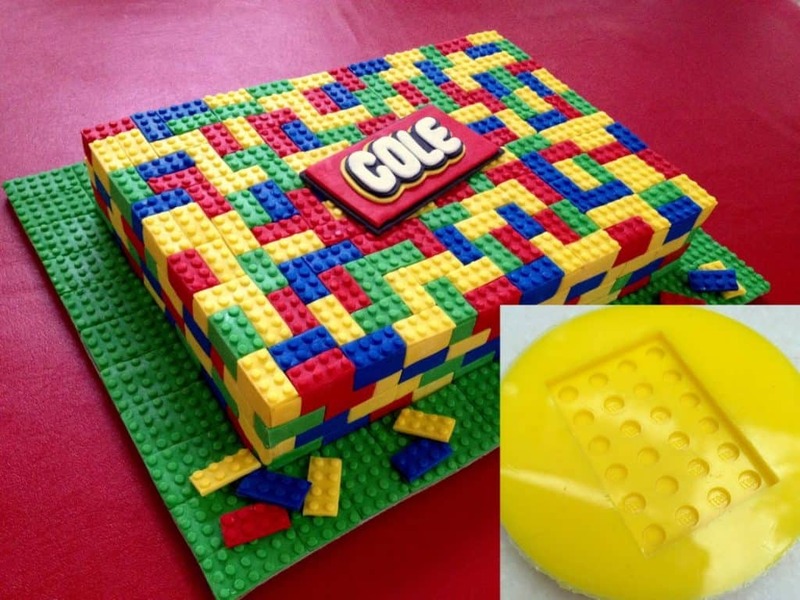 Bake brownies cut into various lego shapes, frost and place a few same color M&M’s on top to create the lego look. Many kids love legos and many of us parents have experienced the pain of stepping on legos. Can you walk the lego fire walk? Build a long low rectangle box and fill it with legos. Ask the brave guests to attempt to walk across the lego fire walk barefoot. Exciting music and bright colors and all that rocking fun 80’s stuff will make this baby shower to be remembered. Use tulle to make table skirts. 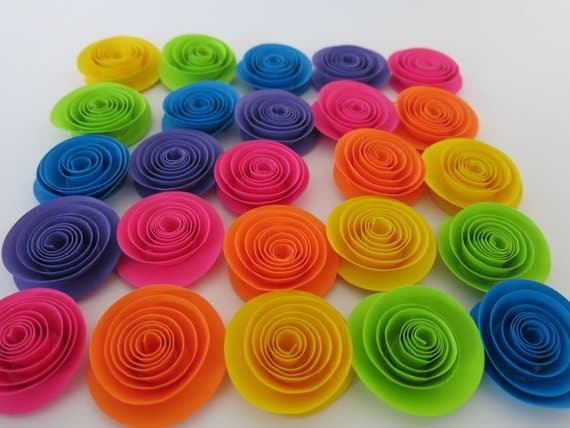 The Neon Flowers from Always In Blossom work perfectly as a colorful 80’s baby shower decoration. Place Rubik’s cubes and snakes on tables for decorations or to be played with. Talking about Mr Potato Head, a fun food idea would be baked potatoes! Serve strawberry shortcakes and cupcakes with 80’s cupcake toppers. Have a candy bar filled with popular candies from the 89’s: Skor, Runts, Skittles, Nerds, Cow Tales, Sour Patch Kids, AirHeads. Play 80’s music for name that tune game. Guess who was a popular game in the 1980’s. Though this Guess Who: Mommy or Daddy from Adorably Allie is not exactly like the game from the past it is a fun baby shower game. Other popular games included Monopoly, Trivial Pursuit, Hungry Hungry Hippos, Connect Four, Boggle and Pictionary. Play a round of baby pictionary and baby trivia. A baby shower theme ideas for boys list would not be complete without the Sports theme. Cheering for your favorite sports team is quite thrilling. And so will participating in this awesome baby shower. Whether it is football, basketball, baseball or hockey or a combination of various sports this boy baby shower theme is surely exciting. If the mom or dad-to-be has a favorite sports team use that as your inspiration. Decorate the place with the team colors and mascots. 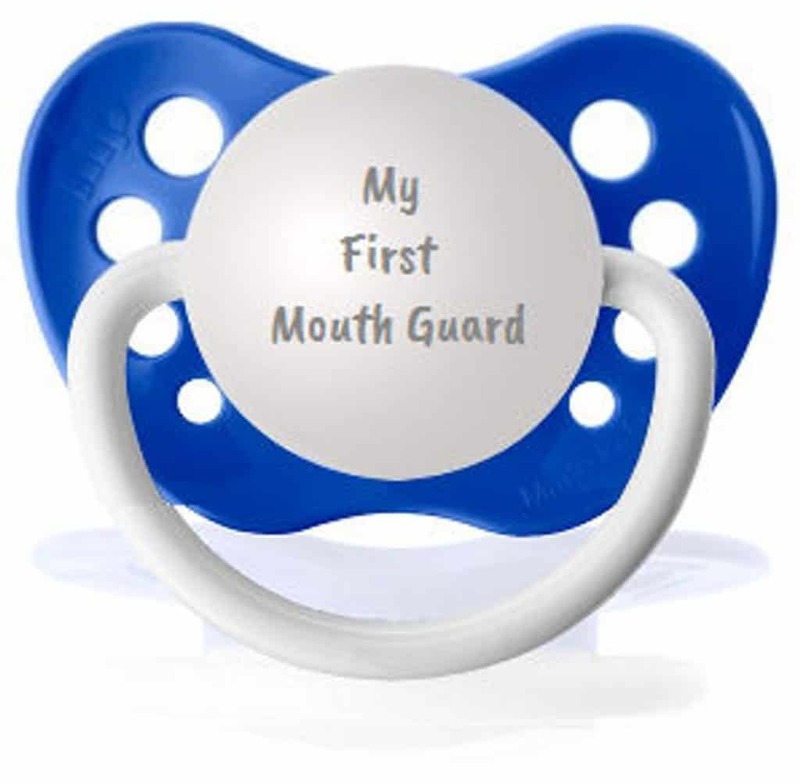 The personalized pacifier makes also a fun baby gift for boys. Serve all the fun stuff they sell at the games: fries, hotdogs, ice cream, peanuts… Or make a cake pop “balls” to match the sport you have chosen. Serve melon balls, cheese balls, chocolate balls. Play games like guess the baby’s birthday, baby ABC, and bingo. Sign a basket ball or baseball. Decorate jersey’s for the baby. A fun-tastic baby shower theme that is entertaining and cute. Have fun with playful food and imaginative decorations. Turn your cupcakes into Truffula Trees by decorating them with cotton candy. Just push a straw into cotton candy and insert into a cupcake. Serve green eggs and ham pretzel bites (place a white candy melts on pretzel squares, put in the oven at 200F for 6-8min, take out and put a green candy on top), Hop on Pop popcorn, Cat In The Hat parfaits (red jello and cool whip layered in pretty glasses), Pink Ink Yink Drink (pink lemonade) and other creative baby shower treats. Play a big B little b what begins with B-game. Give the guests a short amount of time to come up with baby or pregnancy related words that begin with B. Create a Block Making Station with wooden blocks and images of lovable characters from Dr. Seuss books. A fantastic creative boy baby shower activity. The mom-to-be will be thrilled to put these baby blocks in the nursery. The block making kit from Books On Blocks will be a hit!! Thank the guests for coming with fun favors such as Dr. Seuss bookmarks or delightful, colorful Thing 1 and Thing 2 popcorn from Pop Central Pop Corn. 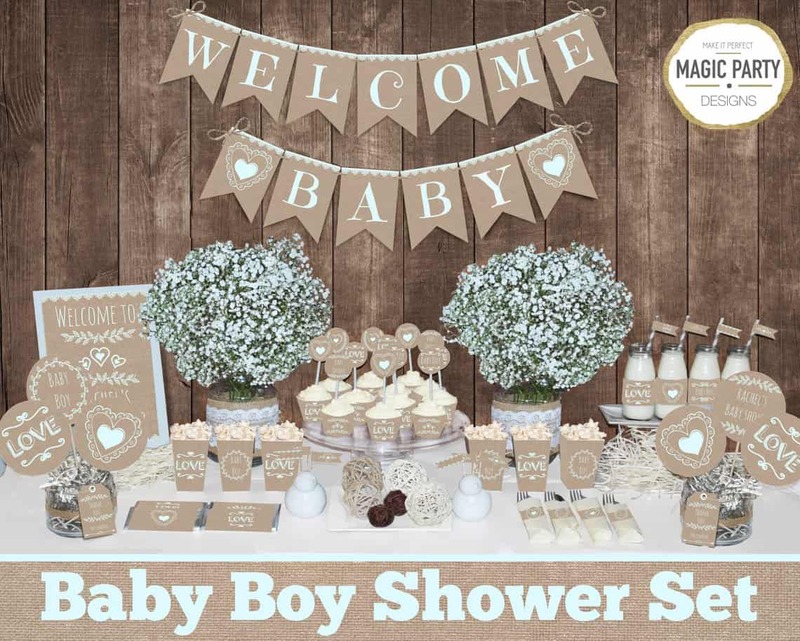 You will put a smile on everyone’s face with this baby boy shower theme. Dr Seuss Storybook Quilt: Carlene Westberg (this quilt is a amazing and can serve both as a backdrop for the dessert table and aas a wonderful baby shower gift. These lovable characters entertained the children in the 1980’s and will entertain the mom-to-be and the guests. It is easy to pick the color scheme for this baby shower: blue and white! Decorate the party with blue and white pom poms and lanterns. Use blue and white plates and cups. 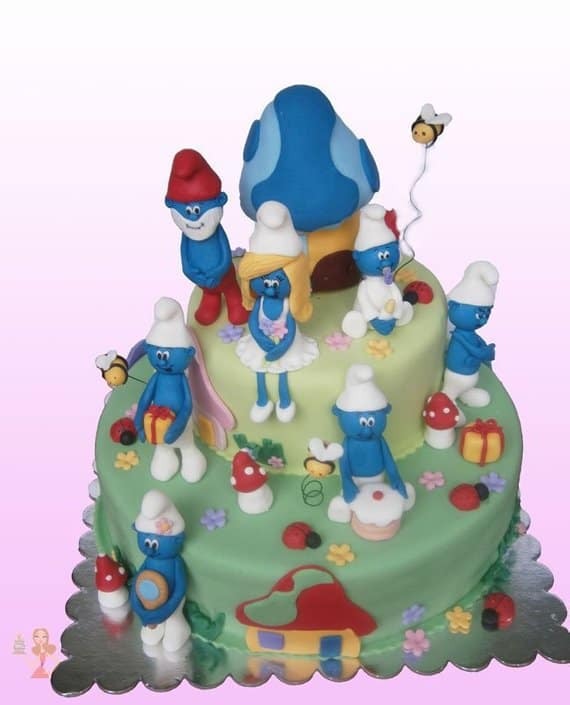 Adorable Smurf Cake Toppers from Memento Cake Toppers will be perfect for this cute unique baby shower theme. Serve blue and white candies in glass jars. Wrap tulle around them. Play the smurfs bingo. Get a couple of smurf puzzles and divide the guests in teams and see which team can put together the puzzle first. This and so many other baby showers can be hosted on a budget. Giddy Up! Jump on your horse and gallop to this awesome baby shower! 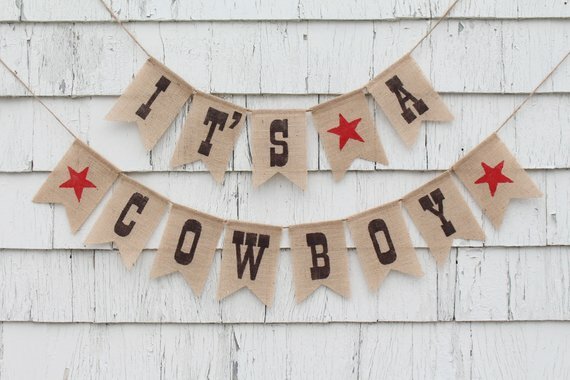 Many fun ideas for hosting this western theme baby shower like this cute “It’s A Cowboy” Banner from Ichabod’s Imagination. Wow your guests with a horseshoe shaped cake or serve cupcakes with cowboy hat and boots cake toppers. Make marshmallow pops with cowhide print. Serve cookies that are shaped like cowboy hats, horseshoes, boots, and horses. Prepare chocolate cowboy hats with these cool molds. For an easy delicious main course make Cowboy Casserole. It is a crowd pleaser. Decorate cute western style bibs! The bib set from A Crafty One LLC comes with six bibs fit for a cowboy. The guests can get creative and write or draw sweet messages to the baby. If you have kids participating in the baby shower, they might enjoy a game of horseshoes. And depending how far along the mom-to-be is you could do some line dancing or at least play good ol’ country music. Maybe play a round of “name that tune”. This party will make you go Yeehaw! The best baby shower theme for the outdoorsy mom! She’ll feel so at home surrounded by all the fun adventurous ideas of this unique baby shower theme. Can you just feel the excitement of the great outdoors! 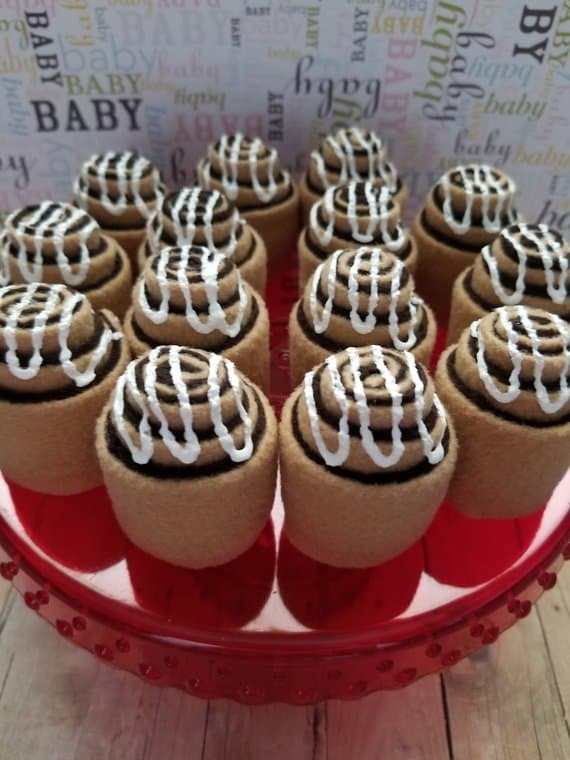 Swiss rolls as “logs”, berries, pancakes, donuts work well with this baby shower theme. Play how many Gummy Bears in a jar and find the canoe – a scracth card game from Created By Us. Write notes with fabric marker on these beautiful theme fitting fabric pieces. Send them to back to Crazy 4 Claire be sewn into a wonderful quilt for the baby. This blanket will be treasured by the mom. What are little boys made of? 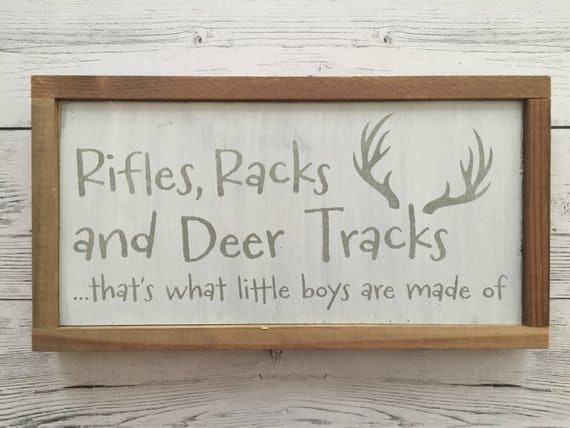 Rifles, racks and deer tracks… a cute rustic wall art from June and Kate Home. If the dad-to-be is a hunter he’d be thrilled to participate in this shower. Make it a rustic country style and it will be a shower that appeals to many. Adorn the cupcakes with wooden antler cupcake toppers from Thick and Thin Designs. Ask the guests to press their fingerprints on this tree wall art from Megan H Studio. The fingerprints will be the leaves on the tree. Really cute and unique baby shower activity. You’ll love these stylish train boarding pass invitations from Parties by the Bundle. The guests will be excited get on board the Baby Express. Decorate with train tracks and trains. Make train cars out of baskets by attaching train wheels to them. Use as centerpieces. Serve treats from train cars and top the cake with this adorable train cake topper. Train painting station. What a great way to entertain the guests! They each get to participate in making this cute train set for the baby. You could also customize this train set to fit your train baby shower theme. Use as a centerpiece on the dessert table or create a centerpiece for each table with a train car. You might also like this fun travel theme baby shower idea! Welcome the Baby Prince with this royal baby shower. Royal blue and golden yellow are the perfect colors for creating an atmosphere fit for a king. The mom to be will feel like royalty surrounded by these beautiful baby shower decorations for boys. 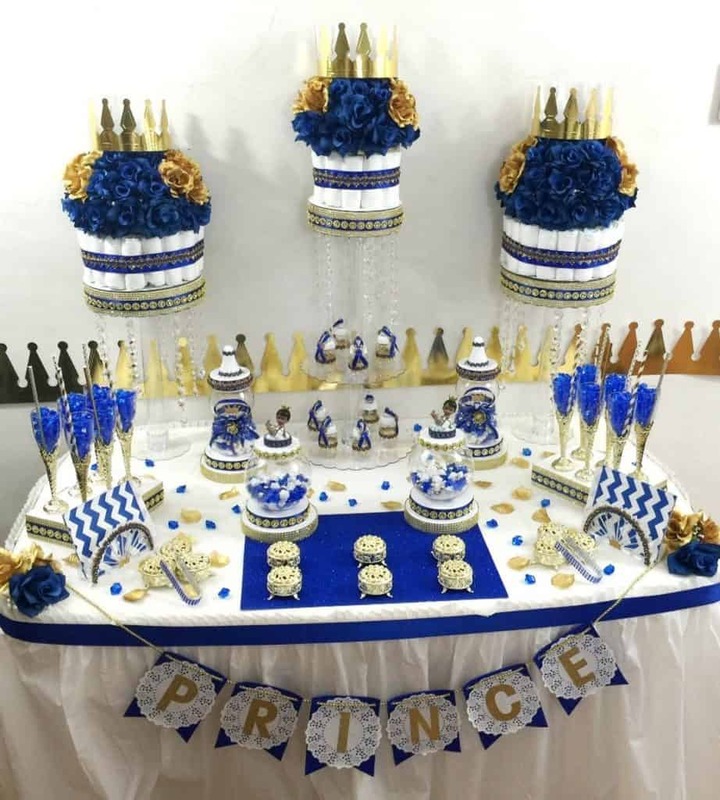 The Royal Prince Centerpieces from Platinum Baby Showers are gorgeous! 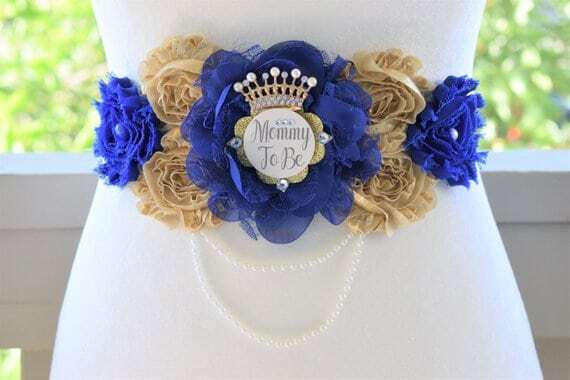 Any Mommy To Be would love to wear this gorgeous Belly Sash from FlowersByCris. If she does not already feel like royalty this sash ensures that she will. You can also use also crowns and scepters to create awesome centerpieces or decorations to put on the walls. With blue and gold frosting, fondant, ribbons, and tulle any dessert can be fit for a royal prince. Dip pretzel sticks in blue candy coating. Top with gold sprinkles and add a crown at the top. Or buy Royal Prince pretzel sticks from Cupcake Novelties. Make crown, throne, and scepter shaped cookies and decorate with blue frosting and outline with gold. Fill bowls with blue and gold candies. Serve cupcakes with crown, royal or prince cupcake toppers. Turn ordinary clear plastic cups into fancy creations with crown cutouts. Add a splash of color with blue striped paper straws. Use cake stands for serving the cupcakes. Wrap a box or two with gold or silver wrapping paper to act as a stand for cookies or pretzels sticks. How well do you know royalty? Match the baby with the royal parents. Personalize oven safe mugs: Queen Mother, Queen of Everything, It’s Good To Be Queen, Queen of Coffee, Queen of the Office, Nap Queen etc. Prepare the mom-to-be for all the laundry that is waiting for her! But baby clothes do make cute decorations. Make onesie or baby sock garland to hang over the gift and dessert tables. Little shoes could be placed on top of tiny diaper cakes. Prepare sock bouquets and onesie cupcakes to adorn the party area. Place this humorous laundry wall art from 163rd St DeSigns Co on the gift table. At the end of the shower, gift all the cute clothes to the mom. She’ll love it!! Serve sock or onesie or jeans inspired cookies. Make cute baby hat cupcake toppers. Personalize jeans, t-shirts etc. for the baby with iron on patches. Or use fabric markers to write fun messages. See who can hang up a laundry basket full of baby clothes the fastest. Follow the easy instructions for Giant Lollipops DIY. Create a Candyland Walk with Duct tape or card stock. Make big ice cream cones with lanterns or balloons to be placed around the party area. Adorn the tables with colorful tulle table skirts. Put various colors of cotton candy in glass jars and use as centerpieces. Well, what would go better with a candyland baby shower than candy bar! Serve various candies on pretty platters or jars. Push Dum Dums lollipops in a styrofoam ball to create a fun candy ball. Just look at these creations! 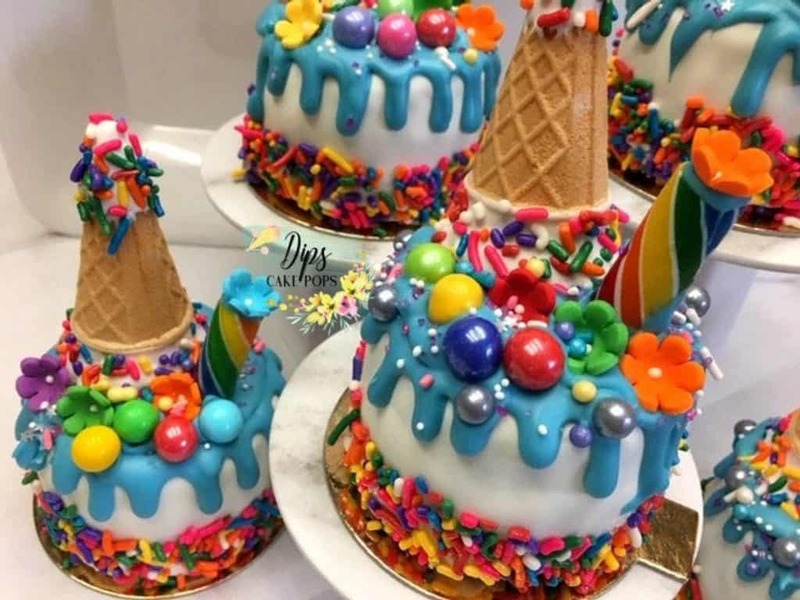 The cutest Candyland mini cakes from Dips Cake Pops. Maybe these are something you can put together yourself but I know I certainly could not. An adorable dessert for a baby boy shower. Put candy in a jar and play Guess how many in the jar. Test your knowledge of candy with candy trivia. Form teams or handout everyone the game and see who gets most correct. So many fun ideas for this baby shower for the mom who loves colorful things and has a big sweet tooth :). This party will knock even your socks off!! Hula hoops were in. Use a hoop to make a wreath or come up with other creative ways to use them as decorations or perhaps have a hula hoop contest. Get fun Retro Diner Printables from Hello My Sweet. Everyone will love to make their own soda floats or milkshakes. Serve hamburgers and fries. Remember the cool letterman jackets? Decorate cookies like that or get a real one for the baby and use that as a decoration. Play a round of bingo. Play 50’s music for name that tune game. 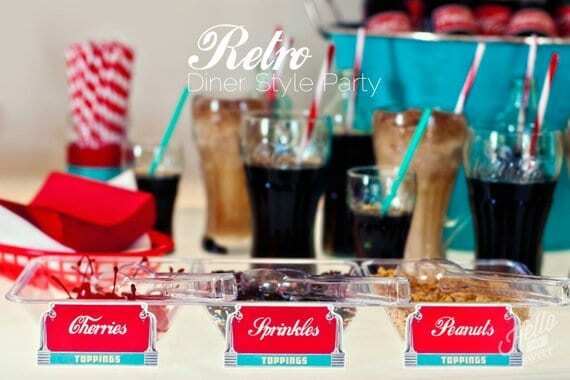 You can do so many fun things with this 50’s retro diner baby shower theme.